At this point in my life, the joy of Christmas is certainly more in the giving of presents than in the receiving of them, but that’s not to say I’ll turn down a thoughtful gift. One gift I received this year was a massive tome titled Culinaria China. Weighing nearly 10 pounds and damn close to 500 pages long, it’s hard to know where or how to start. Thankfully the book is divided 18 sections with each section devoted to a major province, but it wasn’t until after the madness of the holidays that I was able to really sit down and thumb through this installment of the Ullmann Culinaria series. With my predilection of “ma la”, it is little wonder that the first province I looked for was Sichuan province. However, I quickly had the rather annoying realization that recipes were in relatively short supply in this book. The Sichuan section contained a scant seven recipes and looking through the recipe index, there were scarcely 200 listed for the entire book. More than a little disenfranchised, I put Culinaria China back on my shelf for abnormally large books and essentially forgot about it for the next month. 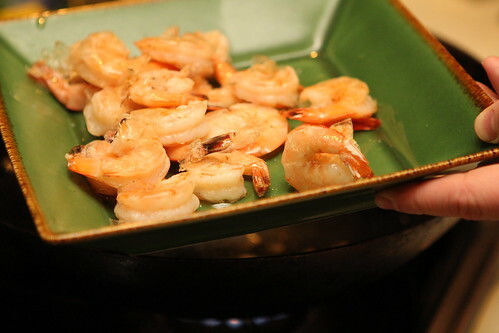 Feeling guilty that I didn’t give any of Culinaria China’s recipes a chance, last week I decided to see what it could offer in the way of ideas for shrimp. 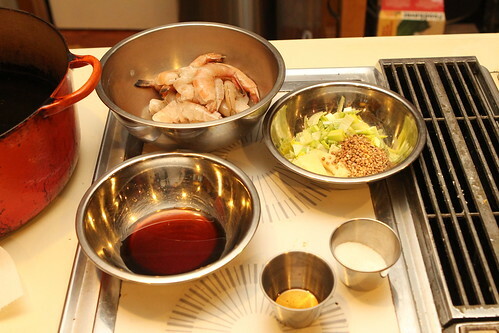 Settling into the section titled Shanghai Delicacies, I decided that a recipe for Freshwater Shrimp would be fine place to begin. As you may have guessed, freshwater shrimp are a bit hard to come by in Jackson, Mississippi so I made do with some fresh gulf shrimp in their stead. 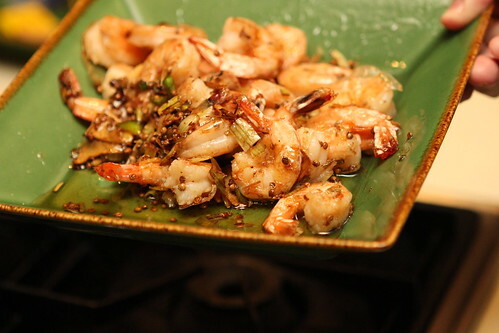 Besides being a recipe that used shrimp, I was intrigued by the idea of coriander seeds in Chinese cuisine. The recipe didn’t mention deveining the shrimp but I decided it would be prudent. 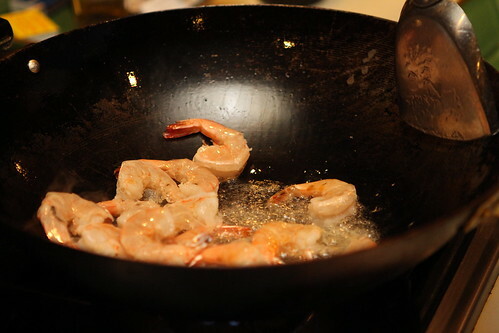 With my wok over high heat, I added a half cup of oil until it began to smoke and then added the shrimp. Instructed to fry until tender, I pulled them when they were just turning pink. 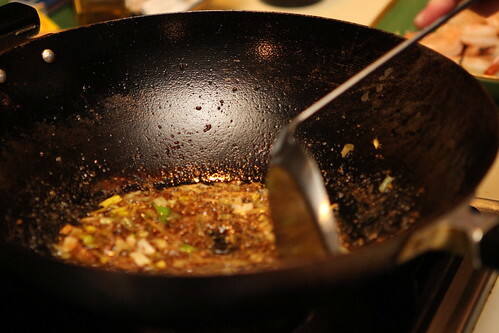 The remaining ¼ cup of oil was added to the wok and after waiting for the first wisps of smoke, the next step began. 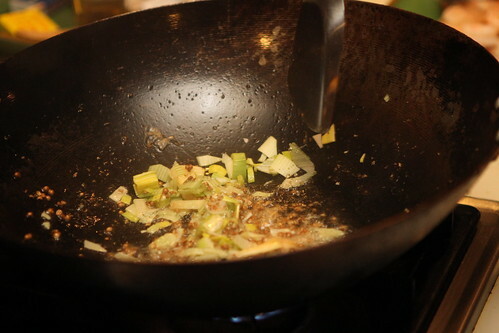 Ginger, coriander, and leek stir fried until tender. 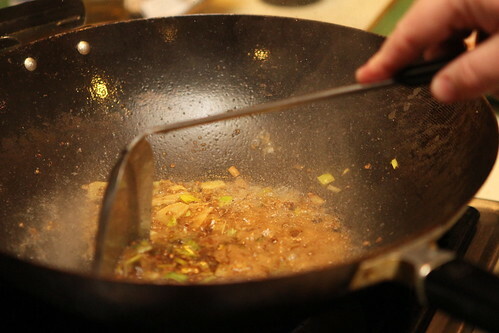 I then added the rest of the ingredients, the rice wine, salt, sugar, soy sauce and water. At this point, the recipe was a bit vague. I was instructed to cook this sauce for five minutes but I would have had a wok coated in fragrant caramel long before that time was up. Hoping to get a good coating of flavor on the shrimp, I added them back to the wok along with the sesame oil and tossed to coat. As the picture suggests, this shrimp were a bit oily but the sweetness of the caramelized sugar in conjunction with the coriander and ginger was captivating. 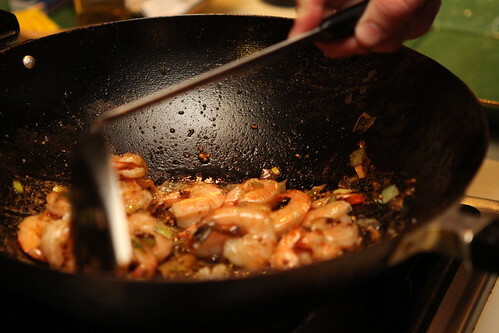 The shrimp were gone in a flash with little more than a pile of shells and burnt sugar on my wok to show for it. Although it a while for me to give this book a chance, I was quite pleased with the results of the first recipe. At the very least, while this book may not be bursting at the seams with recipes, it does provide some unique insights into the cultures and gastronomic diversity of a few of China’s provinces. That’s good enough reason to keep Culinaria China around for a little bit longer.